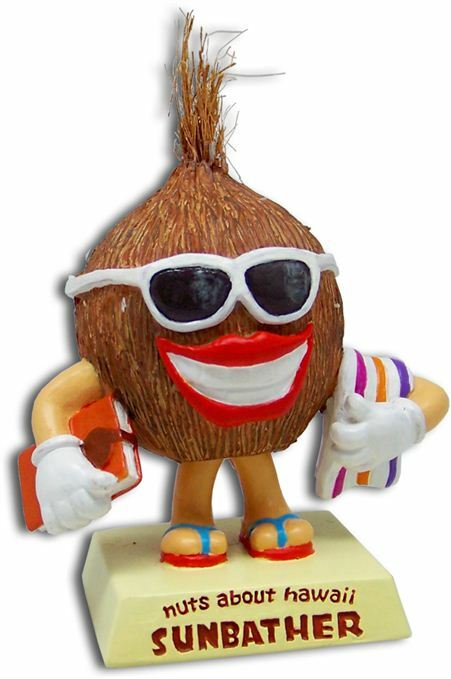 These funny coconut-shaped bobble head dolls are part of a collection, each one exhibiting an activity related to Hawaii! From the Tourist to the Sunbather, and the Mai Tai Tester to the Golf Nut, each one if unique and charming, sure to bring a smile to everyone! This dashboard hula man is perfect for our jeep dash! It is unique and well made. Purchased Item: With blue surfboard Happy Tiki Dashboard Doll 4"
We love him,grand kids play with him at the "beach" ( actually a mousepad [picturing a beach) , guests comment favorably. Purchased Item: Natural color skirt Money Tiki Dashboard Doll 4"
She and her " husband " favorites in our kitchen.